Mrs Young explaining that she wants to travel, and Mike being welcomed back as a resident of No 28. Mike comes in, dragging a big suitcase. He apologises for being early, but his mother has moved in with her sister until she leaves for her trip and wants him out of the way. Daphne shows her sense of the priorities by reassuring him then bringing Bouncer in to say hello. Scott asks Helen when she is going to begin the portrait of Mrs Mangel. Helen replies that she intends to leave work early and do preliminary sketches that evening. When Scott expresses his puzzlement about how she was conned into doing it, Helen responds that she is a pushover, soft as marshmallows. Paul is looking through the appointments for the promotions manager applicants and Helen asks how it's going. Jane comes in and says that Miss Lewis is outside. Paul is puzzled. The first candidate isn't due for half an hour … and Miss Lewis isn't on the list. Jane and Helen persuade him to see her, because she has shown initiative in just turning up. HELEN: I'll work outside while you do your ogre number. PAUL: Good. I can do without you smirking in the background. GAIL: Hello, Paul. If I'd known it was you who put the ad in the paper, believe me, I wouldn't have bothered. MIKE: I always thought it was Dad who kept Mum from having much to do with me, but I was wrong. DAPHNE: replies that maybe she feels guilty and she can't tell you that? Maybe when she gets back from her trip, you'll be bale to sort things out. MIKE: I'm not gonna kid myself, Daph. She only wanted me when she thought she didn't have any money. She thought I could have been useful. When she found out about the insurance epolicy, she didn't need me any more,. It's good in a way, I suppose. Just gotta get used to the fact that I don't mean anything to her. DAPHNE: You mean a lot to me ... and Des! MIKE: (a bit choked) The feeling's mutual, Daph. Daphne suggests a dinner party to welcome him and says she will invite the Robinsons. 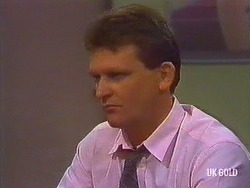 Mike asks if he may bring Jane and Daphne agrees, but he is to make sure that Mrs Mangel isn't invited. They joke about Helen and the portrait. GAIL: You've just got to admit it's a hell of a surprise. You're the last person I expected to see here. PAUL: Yeah, well, it is a bit of a change from the airline, isn't it. He explains the background, and how it is a family business, that he has been there since he left the airline. GAIL: (a little defensively) Just because we didn't work well together doesn't mean I didn't think you'd get ahead. Paul asks about Jeremy and Gail explains that they are one of the four out of ten Australian marriages, and that this is why she is back in Erinsborough and needing a job, though she is no longer sure about this one. Paul suggests that they meet later for dinner, after he has seen the other applicants, but Gail wonders if this would compromise his position. They establish that she is staying with her father. PAUL: So I'll pick you up at quarter to eight. GAIL: Still the same confident Paul Robinson! I probably won't get the job, but at least I'll get a pleasant dinner. He sees her out. Helen asks if that was Rob Lewis' daughter, to which Paul replies that it is, and disappears into the office, to Jane's chagrin, as she wanted to know more. Gail comes in, sits down, slips off a shoe, rubs her foot and sighs about sore feet. She tells a sympathetic Daphne that she has had several job interviews, including the one at Lassiters. Daphne is tactful and replies that he is a very good businessman. Gail responds that she knows what he is like, and explains that she used to be his boss. She says, resignedly, that she could have a job at Rob Lewis' Mechanicals. Daphne suggests that she lets them know when she has chosen her order, and moves away to where Mike is, shoving food into his mouth like he's fasted for a month. She asks him to look after the shop while she goes to invite Helen, Jane and Paul to dinner. HELEN: Did they all end up as dinner dates, or only the attractive ones? PAUL: Only Gail, and only as a friend. He explains that he may not hire her as they didn't get on too well before. Enter Daphne, to invite them to dinner at no 28. Paul makes his excuses and disappears into the inner office. Helen offers to go early to help and Daphne accepts, gratefully and Helen says she will tell Daphne about Paul's dinner date later, as Paul is probably listening at the door. Helen is putting the finishing touches to the table and Daphne is putting finishing touches to the meal. Des says he wants to give Scott his award before they eat. He explains that it is the Clarke Award For Bravery and asks Daphne to present it to Scott, who protests that he only did what anyone would do… He opens the parcel, which turns out to be sheepskin car seat covers. Des turns to Mike and says how glad he is to have him back, not only because they like him, but because they want a big brother for the baby, and he's the best big brother a kid could have. Gail asks about the competition for the job, then talks about her prospects, saying that she could have a job working for her dad. Paul makes a comment, “Like father, like daughter?” She says that Rob is not such a tyrant and goes on to comment that Paul was bad at taking orders – especially from a woman, which Paul concedes as the truth before adding that maybe that is why he wanted to be the boss. Gail then orders lobster, with a sly look at Paul, who looks quizzical. Des and Jim are washing up and Scott asks if he and the others may go back to no 26. Jim sighs with relief that there will be peace at last. Scott turns off the music and the younger ones disappear. Daphne comments that she can't imagine her baby being that big. She has difficulty imagining it to be a toddler. She's been reading books on baby care, but Des suggests that the best way to learn is from those who've had their children, like Jim. He proceeds to put both feet in it by suggesting that Jim finds it hard to keep up with the kids now he is getting on a bit. An argument ensues about fitness and Helen and Daphne try to cool it down. Des is partnered by Daphne, who frustrates him by letting the other two know what is in her hand and then making a random discard. Jane asks Charlene about the job hunting, but Charlene is short with her, saying Jane can have no idea how it feels because she got her job almost at once. Poor Jane tries to apologise, but Charlene snaps at her to get off her case. Paul and Gail are talking about her break-up with Jeremy. Paul is very surprised because they seemed to be an ideal couple. Gail retorts that appearances can be deceptive. He says that he will let her know about the job. Mike is sitting on the settee, and Jane is sprawled along it with her head in Mike's lap. Scott and Charlene are sitting on the floor, Scott leaning against the settee, Charlene, looking very sulky, leaning on him. Scott is saying that another year at school isn't that bad. Jane says they might even end up going to Uni at the same time. But she's enjoying working so much at the moment she might even delay going to Uni further. Scott tells Charlene she's the luckiest of them all, not having to get up early in the mornings. Charlene doesn't think she's very lucky though. Scott says the teachers aren't hassling him anymore, they seem to treat him as older now. Charlene gets fed up and goes off to make more coffee. In the kitchen she clearly feels like her life is going nowhere. Des is telling Daph off for playing the wrong choice of card. Daph tells Des quietly that it's just a game - he's being a bad sport and it's very embarrassing. Jim baits Des saying that the youngies can't keep up! 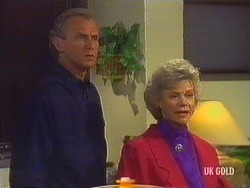 Helen goes home and Daphne goes to bed, dismayed at the male rivalry between Des and Jim. Jim and Des start playing poker. JIM:(sarcastically) I can still remember how to play poker. My memory's still holding out. DES: Well it'd need to be, old-timer. When it comes to poker, I'm unbeatable.